The Pediatric Skull Base and Pituitary Surgery Program at Weill Cornell Medicine Pediatric Brain and Spine Center is dedicated to providing patients with compassionate, state-of-the-science care and treatment. Pediatric neurosurgeon Dr. Jeffrey Greenfield directs the program, where he is paired with Dr. Theodore H. Schwartz, an internationally respected pioneer in the endoscopic endonasal approach to the anterior skull base.The combination of Dr. Schwartz with Dr. Greenfield, who has extensive neuro-oncologic and pediatric neurosurgical training, creates a team of world-class surgeons without equal in terms of breadth of experience in treating children with tumors and lesions of the pituitary gland and anterior skull base. Several important structures, including the pituitary gland and the optic nerves, are located within an area referred to as the anterior skull base. Diseases or conditions affecting these structures can be challenging to treat in children. Our program provides an integrated multidisciplinary approach to the comprehensive care and management of pediatric patients coping with disease processes involving these structures. The endoscopic endonasal approach to the anterior skull base provides a minimally invasive way to remove tumors that would otherwise require either a large cranial opening and brain retraction or disfiguring facial scars. lnstead a small cylindrical camera called an endoscope is advanced through the nostrils, eliminating any external scars. 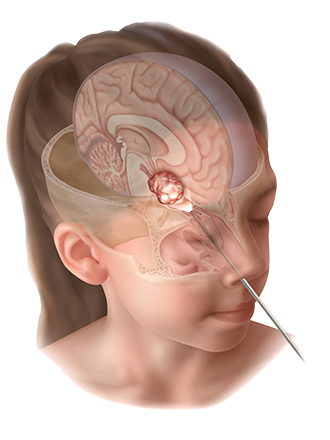 A variety of tumors can be removed in this fashion, since the normal sinus cavities provide access to a large area at the base of the brain. Although the approach is minimally invasive, the surgery is no less aggressive in achieving a complete tumor resection compared with more traditional transcranial or transfacial approaches.